I’m not normally one to dig into the Greek text and focus on individual words much, but I was surprised in finding the word translated “neighbor” here in this passage. I expected the word “brother”. The word Paul uses here – πλησίον (plēsion) does not refer to someone you share kinship with, it refers to someone with whom you share space. It means the person nearby. So, here Paul means neighbour in the same sense that Jesus meant neighbor in the Parable of the Good Samaritan. I have heard a lot of talk about diversity and cultural boundaries the last few years, but I have heard a lot less about being good neighbors. Perhaps we have been more dependant upon peyote like Fred Rogers to keep us neighborly, and in his absence we have reverted back to our natural state of suspicion towards those nearby. I don’t know. I’m not a very good neighbor myself. It might not look like it, but I live in a neighborhood that has drugs, prostitution, meth labs, and plenty of scenes that could have made it into the old television series “Cops”. When I get suspicious of neighbors it is not only due to issues of diversity, it is because I hear the shouting in the middle of the night as they fight in the street and I can remember the house next to us burning down when the meth lab exploded. 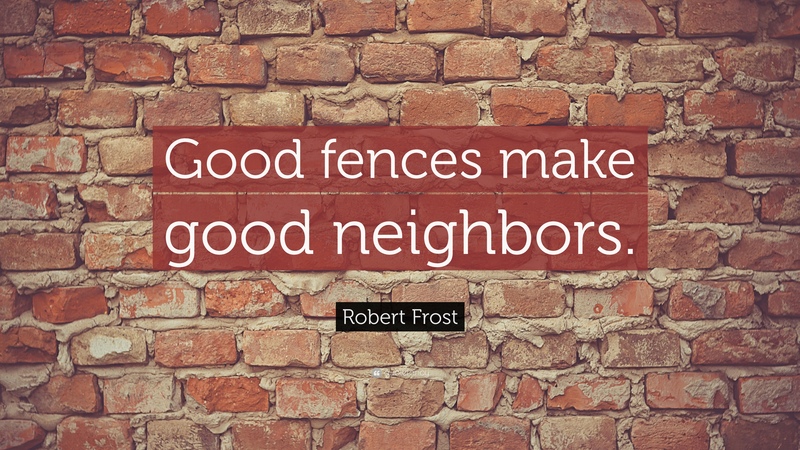 Those memories are all challenges to my small attempts at being a “good neighbor”.I can understand Robert Frost‘s admonition about building fences and by extension, I can understand the nation’s desire to build walks around ourselves. Maybe Paul had neighbors like me. I appreciate that he did not begin this passage with a generic slogan to love our neighbors. No, instead he challenges us to speak the truth to them. Building a fence is a way of speaking about separation and disconnect. This is where I end and you begin. Yet the next sentence from Paul says that is not truth but a lie. Paul claims we are all members of one another. Again, remember this is not family or even church family. He is shedding about the person nearby… your neighbors. Either the walls are lies our Paul is lying (or just wrong on this account). He continues on and writes that it is ok to be angry, but not ok to keep that anger in without speaking about if. Could it be that this treasured piece if marriage advice was actually intended to be used between neighbors? Paul writes that we should not steal from one another, taking advantage of one another, but instead we should use our words in particular and our deeds also to build up our neighbors. We need to put away our bitterness and forgive our neighbors as Christ forgave us. What do you communicate to your neighbors? How do you build them up? How do you show them forgiveness as Christ had shown you?